Cindy Hyde-Smith was appointed to the United States Senate by Gov. Phil Bryant on March 21, 2018. Her appointment became effective April 1, 2018, the date Senator Thad Cochran retired from the Senate. She will also be a candidate for this seat in the special election that will be held on November 6, 2018. She is a lifelong conservative demonstrated by her strong voting record as a State Senator and her leadership as Mississippi’s Commissioner of Agriculture and Commerce since 2012. 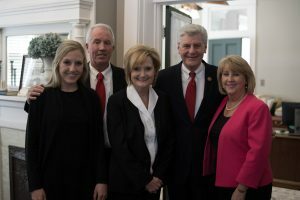 Cindy Hyde-Smith sworn in by Gov. Bryant as Mississippi’s first female U.S. Senator. Cindy is a longtime, strong supporter of President Trump. She co-chaired the Trump Agriculture Policy Advisory Council during the presidential campaign. She has continued to work closely with the Trump Administration, including participating in key White House meetings with Vice President Pence and USDA Secretary Sonny Perdue regarding the benefits of the tax cut legislation. As our new U.S. Senator, Cindy will always put Mississippi first by protecting the historic Trump tax cuts which are unleashing a wave of booming economic growth and low unemployment across America; repealing unnecessary regulations that get in the way of American farmers, workers, and small businesses; supporting President Trump’s immigration reform agenda including building a wall on the southern border of the U.S.; rebuilding America’s military and readiness by working with President Trump and our Republican majorities to make sure the military is stronger than ever; honoring the promises made to America’s veterans; championing Mississippi’s economy; finishing the fight to repeal Obamacare; protecting the 2nd Amendment and supporting the right to life of the unborn. In 2011 and 2015, Cindy was elected as a Republican to serve as Mississippi’s Agriculture Commissioner, both times as a Republican. In the 2011 election, she won a three-way Republican primary without a runoff. As Agriculture Commissioner, she over saw the single largest economic sector in Mississippi – agriculture – and delivered for the state. She helped re-open the market in China for American beef exports; fought for country-of-origin food labeling; led the effort to ensure foreign catfish are properly inspected by USDA; streamlined government regulations to save Mississippi farmers and small businesses money; held agency spending below 1 percent growth her entire tenure including zero growth multiple years; ran the “model agency” according to the state legislature—based on performance and program effectiveness; improved disaster preparedness, and modernizing the agency with cost-saving technology. As a lifelong conservative, Cindy brought her values to the state Legislature. She was elected a senator in 1999, serving for 12 years, and she quickly became known as a passionate advocate of farmers and ranchers in Mississippi by serving as the chairman of the Agriculture Committee for eight years and as an influential member of numerous other committees. During her time as a senator, Cindy led the fight to protect private property rights against eminent domain abuses and was a strong supporter of tort reform, which ended lawsuit abuse in Mississippi. Those actions paved the way for more jobs and new businesses locating in Mississippi. She also supported fiscally conservative budget initiatives. When the recession hit America, Mississippi’s budget was deeply impacted, and Cindy helped craft a balanced budget that by cutting spending, not borrowing more money. Mississippi’s largest pro-business organization (BIPEC) has consistently rated her as a “business champion.” Over her time in the state legislature, she was among the highest rated senators on pro-business legislation. She has a strong social conservative voting record with a 100 percent pro-life rating, and she’s a lifetime -member of the NRA. Cindy previously received numerous awards and honors for her work as a legislator and champion of agriculture, including the Agriculture Legislator of the Year Award from the Mississippi Association of Conservation Districts, the Ambassador Award from the Mississippi Farm Bureau Federation, the Achievement Award from Delta Council, and the Outstanding Service to Small Farmers Award from Alcorn State University. In 2013, Cindy was also the recipient of the Mississippi Farm Bureau Federation’s Distinguished Service Award. The award is the highest honor Farm Bureau bestows on an individual, and it is reserved for someone who has truly made a difference in the lives of Mississippi farmers. As Commissioner of Agriculture, Cindy worked to ensure fairness and equity in the marketplace and to protect Mississippians through reasonable regulatory practices. She made a commitment to support Mississippi’s farmers and ranchers so they could continue to provide safe food and fiber at the most affordable prices to the citizens of the state, while maintaining the utmost in consumer confidence. She is a graduate of Copiah-Lincoln Community College and the University of Southern Mississippi and maintains close affiliations with the Mississippi Cattlemen’s Association, Lincoln County Forestry Association, Lincoln County Livestock Association, and the Mississippi Nursery and Landscape Association. Cindy and her husband Mike are the proud parents of Anna-Michael, the family’s fifth generation farmer. Together, they raise beef cattle and are partners in Lincoln County Livestock, the local stockyard auction market in Brookhaven. She and her family currently reside in Brookhaven and are active members of Macedonia Baptist Church.